1- Forty years ago in 1977, all clergy in Al-Azhar institution, and its head sheikh Dr. Abdel-Haleem Mahmoud stood against our person. We were at the time an assistant professor at the History Department, Al-Azhar University, and submitted our PhD thesis about the influence of Sufism on religious life in Egypt during the Mameluke Era. Our PhD thesis has exposed, for the first time, the Sufi saints worshipped and sanctified in Egypt and showed their reality. The Sufi Dr. Mahmoud considered our views as a grave insult to him and to his deities (i.e., Sufi saints) and he issued his decrees that we must change our PhD thesis so that it would praise Sufi saints and justify their deeds and views (that express disbelief and polytheism in our view, proven in the thesis), as most theses submitted to Al-Azhar University at the time have expressed positive views regarding Sufism. The Azharite sheikh and professor who supervised our thesis welcomed very much the stance of the head of Al-Azhar, as he grew tired because his arguments to make changes in our thesis were never convincing to us; he had no proofs to refute our views while we have scientific proofs that our thesis results are correct. In fact, Azharite professors/ignoramuses are keen on making their students more ignorant than they are so that ignorance of professors ad sheikhs would not be exposed. Our PhD thesis had its powerful tone, with cited proofs from Sufi books/sources as well as authoritative history and traditions books, and of course the Quranic verses. Our highly critical tone in our thesis made Azharite ignoramuses feel ashamed of themselves, because their Azharite university is the devilish center of spreading ignorance and obscurantism. The professor who supervised our PhD thesis contacted the head of Al-Azhar who was at the same time the main figure who led Sufism in Egypt and in the Arab world. Dr. Mahmoud had waged war against our person, though at the time were merely a young assistant professor. They assumed wrongly that we were going to be afraid, but we insisted never to change a single word in our submitted thesis. We were threatened by the professor who supervised our thesis that he would write a report within few lines asserting that we were not fit to be a researcher, and this might result in removing us from our post as an assistant professor to any other low-rank administrative post at the History Department, Al-Azhar University. This threat meant that we were about to lose exemption from the military service we obtained because of our post as an assistant professor; this would mean that we would be a soldier whose salary is LE 10 per month. This would have been harmful because we are married and have a family to support, plus financial obligations to our extended family members. 2- That we sided with the Truth has been a difficult choice made quickly by us when we asked ourselves the following questions. (1) Is the enmity between these clergymen and professors and ourselves over something personal or because of what we write in defense of real Islam? Thus, this is enmity revolving around our siding to God and their repelling people away from His Path: the Quran. we are defending Islam and they are foes and haters of His religion: Quranism. (2) Do these men provide our livelihood or God is the Provider of it? Of course, the answer is God. (3) Would God forsake us in such an ordeal? Of course not; "...God supports whoever supports Him. God is Strong and Mighty." (22:40). (4) The last question: what we are supposed to do while those tyrants assume they control our future? The answer is found in this verse: "...God has control over His affairs, but most people do not know." (12:21). We have realized that the only thing we have to do was to adhere to the truth and bear patiently with the consequences: "By Time. The human being is in loss. Except those who believe, and do good works, and encourage truth, and recommend patience. " (103:1-3). Hence, we decided to challenge the Azharite men of all ranks. They were astonished and baffled, because they could not understand the reason behind our insistence and perseverance. Later on, a rumor spread about us that we receive huge sums of money from 'foreign powers' in return for undermining Islam and Al-Azhar! This rumor made them too afraid to execute their threats to move us to a low-rank administrative post. Thus, we have achieved victory over these foes. 3- The same situation/ordeal is repeated in 1985, during the fasting month of Ramadan, when the head of Al-Azhar University decided to suspend us from work, suspended our salary and financial dues, stopped our promotion to become a professor, prevented us from leaving Egypt, and sent us to interrogation. All such penalties were because of our authoring of 5 books that we taught to our students in 11 Azharite faculties. The Azharite clergy sent us a delegation of professors of the History Department, where we worked, to formally tell us of these decisions taken by the head of Al-Azhar University. We refused to meet with the interrogation committee the very next day to utter the phrase they desired to hear from us: (these views of ours are wrong), so that the penalties are not exacted and the matter would end. We adamantly refused and demanded from them to tell us about these supposed wrong views in our 5 books. They reminded us of our livelihood and that we must acquiesce for the sake of our children, and we responded to them that if they own and provide our livelihood, we should have deified them as gods. We were bent on challenging them and they insisted on committing their injustices against our person. We suffered a lot because of impecuniousness inflicted on us, especially during Ramadan and we were not ready to host any guests at home from our village and we had many obligations. 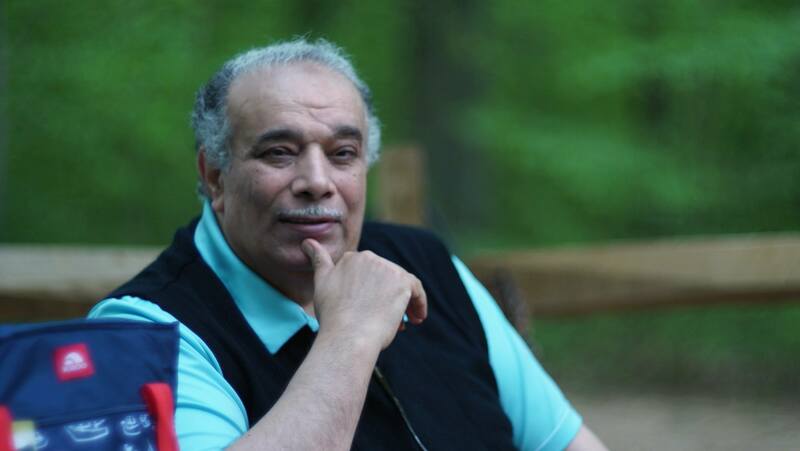 When we took the view of our wife, she told us that Ahmed Subhy Mansour that she knows never leaves the side of the Truth. Thus, it was obvious that our spouse is supporting us and would bear patiently with the hardships to come. We insisted on never letting anyone know about our impecuniousness so as not to let our foes feel schadenfreude and gloat over our misfortune, especially that these foes kept watching over us and getting news of us in Cairo, Al-Matariyya district, and in our natal village of Abou Herez, Al-Sharqiyah Governorate. Other hardships followed, like our incarceration, tendering our resignation from Al-Azhar University, feeling hunger and impecuniousness for longer periods. But we bore everything patiently and persisted, siding with the Quranic Truth. This has been the beginning of the strength of the Quranist trend in Egypt since 1985, and this trend is still increasing and spreading inside and outside Egypt until now. 4- During our suffering and perseverance, we felt the positive changes happening inside our soul; we felt the meaning of devout, reverent supplication to God during prayers while weeping; the five daily prayers had different feel and taste, and we sense the meaning of addressing God saying: "It is You we worship, and upon You we call for help." (1:5). Our belief in the Quran has increased ever since; we have researched, pondered, and reflected on it within new perspectives and angles, using the scientific methodology of research, and our Quranist and history articles and books increased. Our writing made us defeat the impecuniousness imposed on us; we have even authored scenarios and screenplays of movies and TV series, beside articles that were mostly published in many Cairene newspapers in the 1980s and 1990s. 5- We had to choose between two stances in both ordeals of 1977 and 1985; either (1) to flatter and agree with the powerful Azharite clergy to gain financially and to get promoted till we head Al-Azhar institution, since no one had reached our research skills and talents, but these gifts can be used in guiding or misguiding others, an if we were choosing misguiding others in the political and religious life, not one would have surpassed us, or (2) to persevere and be patient in our challenging the obscurantist clergy of ignoramuses by our adherence to the Quranic Truth and to seek reform. We have obviously chosen the second stance; it entails changing oneself to the better and this begins with the ability to do without many items of this transient world. We were ready then to pass throughout the worst hardships and ordeals. 6- We have inferred from the Quran that there are four fates ordained for each individual: one's birth, one's death, one's earnings (livelihood), and one's calamities. Only God is the One to ordain these four fates: out birth place and time, our facial and physical features, our family and parents, our location and timing of our death, and our earnings/livelihood, and the calamities/ordeals we have to go through. Hence, no power on earth could ever save or kill us before our time would come; no one can prevent our livelihood ordained by God to reach us; and no one could ever prevent any catastrophes and tribulations that will test us upon God's command: "If God touches you with adversity, none can remove it except He. And if He touches you with good-He is Capable of everything. He is the Supreme over His servants. He is the Wise, the Expert." (6:17-18). This is Fate ordained by Almighty God, while making human beings as tools to make the four fates occur; yet, human beings are free otherwise, especially in their will to choose anything during their lifetimes, and no human beings can know about the metaphysical realm (i.e., predicting the future). God made human beings free to choose: to (dis)obey and to (dis)believe, and He made people responsible and held accountable for their choices on the Last Day. Thus, if one wills it, one chooses to reform and correct oneself so that one would change to the better, hoping to enter Paradise and to win the grace and mercy of our Lord, while bearing patiently with calamities and tests of life and bearing in mind that livelihood is ordained to be received anyway. This way, one will pass the test of life and succeed among the winners in the Hereafter. Those who chose injustices and remaining silent and submitting to tyranny have failed the test; both winners and losers have their shares of the four fates of course during their lifetimes. 8- We were alone and lonely person persecuted in Al-Azhar University in 1977, and other persecution episodes and events successively occurred to us. Now, 40 years later, we live in peace and security with our six sons in the USA, enjoying blessings and bounties of God; chief among them is the ongoing spread of the Quranist trend worldwide, the increasing number of Quranists, and how sanctified myths are being debunked and exposed outspokenly now. Our name is known worldwide, whereas the names of our tyrannical persecutors, who sided with falsehoods to preserve their power and keep their posts, sank into oblivion, or rather into the dustbin of history. 2- Because they are the worst, biggest criminals who control a given society and the State, facing and confronting them is a big risk; this is challenge that troubled at one point Muhammad himself, and God reminds him (and all real believers) with this fact: "A Scripture was revealed to you, so let there be no anxiety in your heart because of it. You are to warn with it-and a reminder for the believers." (7:2); because religious clergy and political clergy/cronies follow so many sanctified books filled to the brim with myths and falsehoods, we read warning in the very next verse: "Follow what is revealed to you from your Lord, and do not follow other masters beside Him. Little you remember." (7:3). 3- It was a heavy burden for Muhammad to face the powerful tribal leaders of the factions of Qorayish, with their affluence, might, authority, and clergy, using only the Quran; this is why the Quran is described as (a heavy message) in this verse: "We are about to give you a heavy message." (73:5). Those deniers of this heavy message (i.e., the Quran) will suffer a Heavy Day (i.e., the Day of Resurrection) forgotten by them in their transient, fleeting lifetimes on earth: "As for these: they love the fleeting life, and leave behind a Heavy Day." (76:27). 4- Hence, the heavy mission to face and confront tyrants entails a positive change within our souls; i.e., to purify souls: "So that God may prove those who believe, and eliminate the disbelievers. " (3:141). Thus, how come that one may defend God's religion while one disobeys God? So, one is to repent and stop sinning and disobedience so that one does not feel ashamed of oneself while supplicating to God during prayers to guide one to the Righteous Path (see 1:6). Tyrants who persecute preachers of the Truth and reformist thinkers and callers for reform/justice, and many ordeals are inflicted on those who side with God, but they overcome and surmount all trials and tribulations by piety and patience and God's mercy that is nearer to the performers of good deeds, who invoke God and supplicate to Him for support and salvation and to emerge victorious in such troubled times: "...and pray to Him with fear and hope. God's mercy is close to the doers of good." (7:56.). Abraham and believers with him prayed to God to save them from the disbelievers who persecuted them: "Our Lord, do not make us a target for those who disbelieve, and forgive us, our Lord. You are indeed the Mighty and Wise."" (60:5). Likewise, Moses and believers with him prayed to God to save them from the tyranny and persecution inflicted upon them by Pharaoh: "They said, "In God we have put our trust. Our Lord, do not make us victims of the oppressive people." "And deliver us, by Your mercy, from the disbelieving people."" (10:85-86). Thus, one is to purify one's soul using piety and by adopting a highly moralistic stance so that one will be among those who deserve God's mercy and satisfaction to enter into Paradise; God tests our hearts and faiths with ordeals: "Or do you expect to enter Paradise, before God has distinguished those among you who strive, and before He has distinguished the steadfast?" (3:142); "...God thus tests what is in your minds, and purifies what is in your hearts. God knows what the hearts contain." (3:154). 5- In contrast, sins and bad deeds of the worst, biggest criminals lead them to deny God's verses in their words and demeanors, and they deify and sanctify the devilish revelations as well: "Then, evil was the end of those who committed evil. That is because they rejected God's verses, and used to ridicule them." (30:10). 6- The will to change begins with the willingness of individuals to change; thus, if an individual desires to change to the better and exerts conscious efforts to attain this, God's will ascertains and asserts this human will; this is the meaning of this verse: "...God does not change the condition of a people until they change what is within themselves..." (13:11). Hence, when citizens/individuals accepted to let tyrants (and all tyrants are unjust and disbelievers) rule them, God's will assert theirs; e.g., Egyptians accepted Moses' Pharaoh as their ruler and God asserted their will and commanded Moses to address this Pharaoh and not to address Egyptians: "Go to Pharaoh; He has transgressed." (20:24). Even the tyrannical king in the story of Abraham is described as an unjust and a disbelieving king and that God gave him the rule or status of being a king: "Have you not considered him who argued with Abraham about his Lord, because God had given him sovereignty? Abraham said, "My Lord is He who gives life and causes death." He said, "I give life and cause death." Abraham said, "God brings the sun from the East, so bring it from the West," so the disbeliever was confounded. God does not guide the unjust ones." (2:258). This means that as people chose to submit to him, he was made king and God asserted their will. 7- The change to the better is attained first by the will of people/citizens who would choose wither to submit to tyrants or to reject, undermine, and face them. The same human will is the first step regarding (mis)guidance; God will increase guidance and misguidance of those who choose either of them: "Say, "Whoever is in error, the Most Merciful will lead him on." Until, when they see what they were promised-either the punishment, or the Hour. Then they will know who was in worse position and weaker in forces. God increases in guidance those who accept guidance. And the things that endure-the righteous deeds-have the best reward with your Lord, and the best outcome." (19:75-76); "In their hearts is sickness, and God has increased their sickness..." (2:10); "As for those who are guided, He increases them in guidance..." (47:17); "We never sent any messenger except in the language of his people, to make things clear for them. God leads astray whom He wills, and guides whom He wills. He is the Mighty, the Wise." (14:4); "What of him whose evil deed was made attractive to him, and so he regards it as good? God leads astray whomever is willing to be led astray, and He guides whomever is willing to seek guidance..." (35:8). As always, God says nothing but the Absolute Truth.